Google Classroom has made teaching in my classroom so different from past years. Earlier this year, I was trained in using it, and I jumped all in. One of the things I liked best about is the way you can integrate other tech ideas with it to make lessons streamlined. For me, one of the subjects to integrate first and most naturally was writing, and my favorite writing website is The Writing Fix. 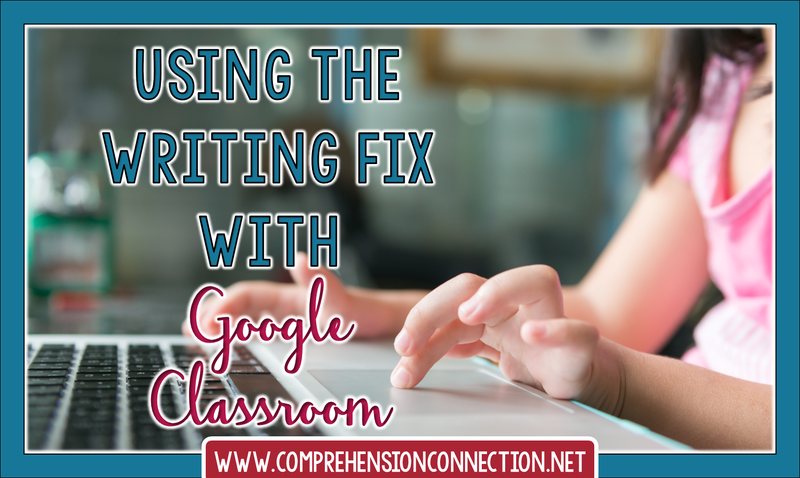 In this post, I'll be sharing how I used Google Classroom with the Writing Fix apps to work through the writing process for a project. 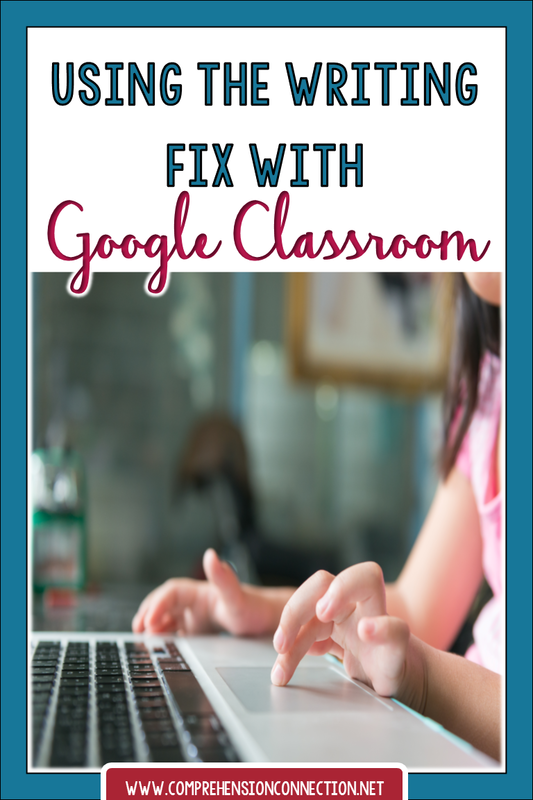 Earlier this week, I did a blog post about getting started with using Google Classroom to organize your students' assignments and routine. If you'd like to check that post out, click [HERE]. One of the best things about Google Classroom is the ease of integrating multiple links to keep your kids organized. It takes time to set it up, but once you've planned out your lesson, it's just a matter of letting it loose to your students. The Writing Fix is a great site to to integrate, and [THIS LINK] leads to the mentor texts for grades 3 and up. The lesson I chose features the book, Dog Breath by Dav Pilkey. Kids love this book since it's so funny, and the prompt focuses on silly animal problems. I chose the Silly Animal Problem prompt for my students, and they are very excited. Dav Pilkey really is hilarious, and I knew my fifth grade group would get a kick out of the book and be instantly hooked on the project. The first thing I did was upload this video from Youtube for my student to read/listen to after they got my morning announcement on Classroom. I had them comment on the book after reading. After the kids had viewed the youtube clip above, we used the app that Writing Fix has embedded with the lesson on their site. This graphic organizer is shared on their site, but I created my own form in Google Docs so that the students could collaborate and share it with me easily. I love that Google Classroom allows you to make each student their own copy. It means they are accountable for the work they complete with their partner. 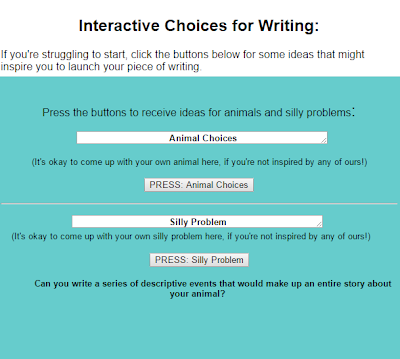 The students used the app provided on The Writing Fix to come up with their animal and problem. The app also helped them take the animal choices in a new direction with options such as a snake or cheetah. With each one, the kids were able to discuss potential issues such as the rest of the jungle animals would laugh at the cheetah's rainbow coat, or the scary cat would be lonely since all the other animals would run away. This teacher made model can be uploaded to Classroom as well to help students think through how to respond. Once the students complete the prewriting plan, the next step will be to create the rough draft. My students will share the pen on this one. We'll use Google Docs for collaborating. This time, the students will work on one paper, so when I add the assignment to Classroom, I'll have to modify it to go to selected students, but you can do that easily (and this allows differentiated assignments for other work too). 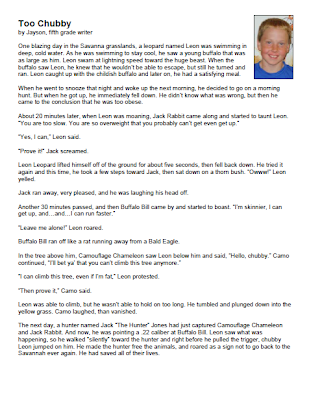 Here's a sample story from a fifth grade student that can be used as an anchor paper. The Writing Fix includes sample papers that you can use with your students to help them understand what is expected with a grading rubric. Of course the rest of the assignment will be to follow the writing process of revising, proofreading, and publishing. I will need to come back for a follow up on the final results, but I hope you'll check out all of the wonderful resources and plans over at The Writing Fix. I highly recommend them. Thanks for linking up with me today! The Writing Fix sounds wonderful. I can't wait to check it out! I am SO excited you are using Google Classroom! LOVE IT!!! It is AWESOME, Julie! My kids start on our board everyday, and it sets the schedule for the period. I am so, so glad I went to the training. Thanks for dropping in.